← Keep On Rolling, Baby! That’s the goal for 2013! 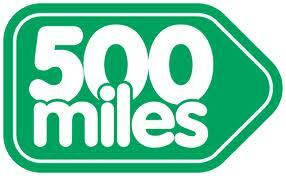 I have until December 31, 2013, to complete my goal of logging 500 miles of running. I’m both excited and nervous about this new chapter in my fitness journey. Setting a running goal is something I decided I wanted to do before the holidays, but I never thought about setting a mileage goal until I read this blog post. I had just downloaded the Run to 5k app and set a goal of being able to run a full 5k by the spring and once I could, I’d start working on my time. After reading that blog, I realized that setting a mileage goal was a fabulous idea and would help to keep me motivated. It breaks down to roughly 10 miles a week, which isn’t too crazy. Granted, there will be weeks when I may not be able to hit the 10 miles. I’m sure there will be weather, soreness and other outside influences and set backs, but I’m pretty confident that I can make it up when the weather warms up or by adding an extra shorter run to the plan. As for right now, I’ve been running at least 3.1 miles (a 5k) three times a week. It’s a walk/run combo that is moving more towards a full run. That distance includes a 5 min walking warm-up and cool-down, which I hope to tack on in the beginning and end of the full 5k (to increase my distance) as I become more confident in my running. Today my legs are really not happy with my running three consecutive days, so I plan on doing some lifting, a nice yoga session and then seeing how I feel as the day progresses. Part of my goal is to also get used to running on different terrains, since I do an annual 5k that is mainly on a wooded trail. For the most part I have been training on pavement, but last week I added my local fitness trail back into the mix. I am much slower on the rocky terrain and my legs fatigue much faster, but that’s okay! I feel a much different burn when I’m doing it and I go into it knowing that it’s going to take time to adjust. Sooooo…wish me luck as I run towards my new goal! I haven’t felt this inspired since I did P90X for the very first time 3years ago! Want to join me in a 2013 goal? If so, let’s hear it and cheer each other on! My goal is to walk a half marathon in May (which I still think you should come out for!). I started a 14 week training plan this week and hope by the time May comes around I am walking a 15/16 minute mile. i have about 4 minutes to shave off right now. How often will you be walking per week? Want to keep each other motivated? Yes! I’ll need motivated when it’s cold or raining especially! The training plan calls for 2 days of timed walking, rest day, timed walking, cross training, and then and endurance mileage walk followed by a day of rest. I’m using the WalkJogRun app and I feel like it’s very doable. The cold doesn’t bother me, however I don’t like the rain.